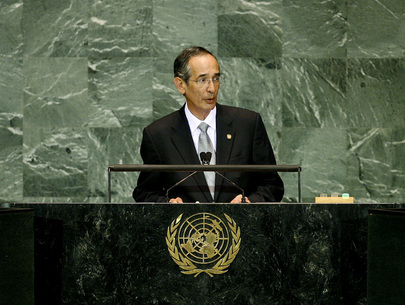 ÁLVARO COLOM CABALLEROS, President of Guatemala, said there were five central topics that were important to his country, which also had important international dimensions. The first was the international economic and financial crisis, which had strongly impacted the national economy, though the rapid reaction of the United Nations and the international community in general deserved praise. With regard to his own Government’s response, he said it had pursued a plan to provide services to the country’s poorest regions, especially among indigenous communities. Insecurity caused by organized crime was another central issue, he said, noting that cross-border drug trafficking involved such a volume of financial gain that international cooperation to combat it was essential. The Government had made significant strides in seizing drug shipments. In terms of international efforts, he highlighted the crucial role played by the United Nations, through the International Commission against Impunity in Guatemala.